Received August 13, 2018; Accepted September 14, 2018.; Published online November 26, 2018. From Xenopus embryo studies, the BMP4/Smad1-targeted gene circuit is a key signaling pathway for specifying the cell fate between the ectoderm and neuro-ectoderm as well as the ventral and dorsal mesoderm. In this context, several BMP4/Smad1 target transcriptional factors have been identified as repressors of the neuro-ectoderm. However, none of these direct target transcription factors in this pathway, including GATA1b, Msx1 and Ventx1.1 have yet been proven as direct repressors of early neuro-ectodermal gene expression. 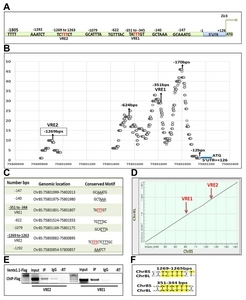 In order to demonstrate that Ventx1.1 is a direct repressor of neuro-ectoderm genes, a genome-wide Xenopus ChIP-Seq of Ventx1.1 was performed. In this study, we demonstrated that Ventx1.1 bound to the Ventx1.1 response cis-acting element 1 and 2 (VRE1 and VRE2) on the promoter for zic3, which is a key early neuro-ectoderm gene, and this Ventx1.1 binding led to repression of zic3 transcription. Site-directed mutagenesis of VRE1 and VRE2 within zic3 promoter completely abolished the repression caused by Ventx1.1. In addition, we found both the positive and negative regulation of zic3 promoter activity by FoxD5b and Xcad2, respectively, and that these occur through the VREs and via modulation of Ventx1.1 levels. Taken together, the results demonstrate that the BMP4/Smad1 target gene, Ventx1.1, is a direct repressor of neuro-ectodermal gene zic3 during early Xenopus embryogenesis. BMP4 is a member of the transforming growth factor beta (TGF-β) superfamily which facilitates multiple biological phenomena, including axis patterning, germ-layer specification, differentiation, hematopoiesis, etc. (Dale and Jones, 1999; Munoz-Sanjuan and Brivanlou, 2002). Previous studies have documented BMP4/Smad1 leads the ectoderm and ventral mesoderm formation (VMZ) in Xenopus embryos (Dale and Jones, 1999; De Robertis and Kuroda, 2004; Rogers et al., 2009). Blocking of BMP4 signaling by application of dominant-negative BMP receptors (DNBR) also elicits the expression of neural genes, including foxD5b, zic3, fgf8a, otx2 and ncam in animal cap explants (Shim et al., 2005; Yoon et al., 2013; Yu et al., 2016). Studies have shown that BMP4/Smad1 directly induces the expression of Xvent family members, including ventx1.1 (PV.1 and Xvent1b) and ventx2.1 (Xvent2) in animal cap explants of Xenopus embryos (Henningfeld et al., 2002; Lee et al., 2002; Lee et al., 2011). Ventx1.1 is a homeobox transcription factor that represses the expression of organizer-specific genes, including gsc, chordin, and noggin, resulting in the headless phenotype in Xenopus embryos (Ault et al., 1996; Hwang et al., 2002; Hwang et al., 2003). In addition, overexpression of Ventx1.1 causes embryos ventralization and ventral mesoderm formation in Xenopus embryos. Overexpressed Ventx1.1 also inhibits the expression of early and late neural genes that include zic3, foxD5b and ncam in animal cap explants of Xenopus embryos, leading to neural inhibition (Yoon et al., 2014b). Furthermore, morpholino-based knockdown of ventx1.1 increasing the expression of neural and dorsal genes, including zic3, foxD5b, chordin, noggin, gsc, ncam and Xngnr in animal cap explants, resulting in organizer expansion and neural induction in Xenopus embryos (Kumar et al., 2018; Yoon, Kim et al., 2014b). The detailed molecular mechanism of Ventx1.1-mediated direct inhibition of early neural genes during embryonic development of Xenopus, however, still awaits study. Zic3 has been documented as being a member of the zinc finger transcriptional activator and one of the earliest neural genes actively involved in neural tissue specification, including for neural crest and neural plate formation (Houtmeyers et al., 2013; Nakata et al., 1998). A recent study demonstrated Activin/Smad2/3 positively regulating zic3 expression in an AP-1c-jun/c-fos-dependent manner (Lee et al., 2004) and that the ectopic expression of AP-1 induces zic3 expression to trigger neurogenesis in animal cap explants of Xenopus embryos. Previous study has shown the ectopic expression of Zic family members, Zic1-3, leading to expression of the neural crest and neuro-ectoderm specific genes, including en2, Xngnr, slug, N-tubulin and twist in animal cap explants of Xenopus embryos, and promoting neural crest specification and neuro-ectoderm formation (Nakata, Nagai et al., 1998). In the present study, Ventx1.1 inhibited the Engrailed repressor domain-fused FoxD5b (FoxD5b-En)-induced mRNA expression level of early and late neural genes, including zic3, foxD5b, ncam and NeuroD for whole embryos and animal cap explants. In order to explore the possibility of Ventx1.1 as a direct repressor of a key early neuro-ectoderm gene, zic3, a genome-wide Xenopus ChIP-Seq analysis of Ventx1.1 show that Ventx1.1 directly binds to Ventx1.1 response cis-acting element 1 and 2 (VRE1 and VRE2) within the 5′-flanking upstream region of zic3 and represses its transcription. Reporter gene assay demonstrated that Ventx1.1 reduces the relative promoter activity of serially-deleted promoter constructs of zic3 in Xenopus embryos. Site-directed mutagenesis provide evidence that zic3 promoter construct contains the Ventx1.1 response elements, VRE1 and VRE2, which directly inhibit zic3 transcription activation in Xenopus embryos. Additionally, it is shown that FoxD5b indirectly increases the relative promoter activity of zic3 by inhibiting the endogenous expression of ventx1.1 while Xcad2 inhibits the relative promoter activity of zic3 by inducing ventx1.1 expression in Xenopus embryos. Collectively, the results suggest that Ventx1.1 is a direct repressor of the transcription of zic3 and inhibits neurogenesis as one of the key regulatory molecules of BMP4/Smad1 signaling in ectoderm and VMZ during the embryonic development of Xenopus. An approval by the Institutional Animal Care and Use Committee (IACUC) is currently not required for the experimental use of amphibians or reptiles in Korea. However, all our research members attended both the educational and training courses for appropriate care and usage of experimental animals at our institutions. Adult X. laevis were grown in 12 hr light/dark (LD 12:12 hr) cycles at 18°C according to the guidelines of Institutes of Laboratory Animal Resources that are tasked for laboratory animal maintenance. All mRNA used for this study were synthesized by linearizing the target vectors with the appropriate restriction enzymes, including FoxD5b-En: T7, BamHI, Xcad2: Sp6, Asp718 and Flag-Ventx1.1: Sp6, SacII. Each vector was linearized with the appropriate restriction enzyme and used for in-vitro transcription using the MEGA script kit according to manufacturer’s instructions (Ambion, USA). Synthetic mRNAs were quantified by a spectrophotometer at 260/280nm (SpectraMax, Molecular Devices, USA). Cloning of zic3 genomic DNA (gDNA) into the pGL3-Basic plasmid (Promega, USA) was performed as described by (Lee et al., 2004). The 1.8 kb of 5′-flanking region of reporter construct was further sub-cloned into the pGL3-basic plasmid (Promega) by using specific restriction sites of KpnI/HindIII. Serially-deleted zic3 promoter constructs were generated and sub-cloned into a pGL3-basic plasmid by PCR amplification (Table 1). Xenopus laevis were obtained from the Korean Xenopus Resource Center for Research. Xenopus embryos were injected after in vitro fertilization of oocytes that was induced by injection of 500 units of human chorionic gonadotropin (Sigma, USA). RNAs were injected into the animal pole at the one or 2-cell stage embryos and cultured in 30% Marc’s Modified Ringer’s (MMR) solution. The animal caps (AC) were then dissected from injected and un-injected embryos at stage 8.0–8.5 and incubated in 1X L-15 growth medium (Gibco/Thermo Fisher, USA) until stage 11 or stage 24 in preparation for RT-PCR. Ventx1.1 mRNA (500 pg/embryo) and FoxD5b-En mRNA (280 pg/embryo) were injected into the animal pole at the one or 2-cell stage of Xenopus embryos and cultured in 30% MMR solution. Animal caps were then dissected from the injected and un-injected embryos and incubated until stage 11 or 24 in 1X L-15 growth medium. Total RNA was isolated from whole embryos and animal cap explants using RNA-Bee reagent and following the manufacturer’s instructions (Tel-Test, USA) and it was treated with DNase I to remove genomic DNA contamination. RT-PCR was performed with Superscript II (Invitrogen, USA) as described by the manufacturer and with 2 μg total RNA per reaction. PCR was performed according to the following conditions: 30 s at 94°C, 30 s at each annealing temperature, 30 s at 72°C, and 20–30 cycles of amplification (Table 2). Relative promoter activities were measured using a luciferase assay system according to the manufacturer’s instructions (Promega). Five different groups of embryos (3 embryos per group) were harvested and homogenized in 10 μl lysis buffer per embryo. Embryo homogenates at 10 μl each were assayed with 40 μl luciferase substrate and the reporter gene activity was read by an illuminometer (Berthold Technologies, Germany). All experiments were repeated at least three times for independently derived sample sets. Mutagenesis was performed by a site-directed mutagenesis kit (Muta-Direct, iNtRON Biotechnology, Korea) using the primer oligonucleotides in accordance with the manufacturer’s instructions (Table 3). Chromatin immunoprecipitation assay was performed as described (Blythe et al., 2009). Embryos were injected at the one-cell stage with mRNA encoding 3xFlag-Ventx1.1 (500 pg/embryo). Injected embryos were collected at stage 11 (100 embryos/sample) and processed according to the protocol. Anti-Flag monoclonal antibodies (F-1804, Sigma) or normal mouse IgG (SC-2025, Santa Cruz Biotechnology, USA) were then added to the cell lysates to immuneprecipitate the chromatin. ChIP-PCR was performed with the immune-precipitated chromatin using zic3 promoter region primers for VRE1 (163 bps) and VRE2 (245 bps), respectively. These primers are shown in Table 4. The zic3 (Accession number; AF179297) promoter sequence has been submitted to GenBank. Data were analyzed by unpaired two-tailed Student’s t test using GraphPad Prism4 (GraphPad, USA). Asterisks designations are ** for P ≤ 0.01 and *** for P ≤ 0.001. n.s. denotes non-significance. Ventx1.1 is a well-known transcriptional repressor of the Xvent family and is one of the direct downstream targets of BMP4/Smad1 signaling (Lee, Lee et al., 2011). Studies have shown that ectopic expression of Ventx1.1 strongly inhibits neurogenesis and organizer expansion in Xenopus embryos. Overexpression of Ventx1.1 inhibits head-and neuralinducing factors including gsc, chordin, noggin, zic3, foxD5b and cerberus, resulting in headless phenotype and neural inhibition (Hwang, Lee et al., 2003; Yoon et al., 2014a). In the present study, RT-PCR shows that FoxD5b-En-induced expression of early and late neural genes could be inhibited by Ventx1.1 expression. Ventx1.1 mRNA co-injection with FoxD5b-En significantly reduced the FoxD5b-En-induced expression of early and late neural genes, including zic3 and foxD5b (early) at stage 11 (Figs. 1A and 1C) and ncam, Neuro D and Xngnr1 (late) at stage 24 (Figs. 1B and 1D) both in animal cap explants (Figs. 1A–1B) and in whole embryos (Figs. 1C–1D). On the other hand, neuro-ectodermal gene (FoxD5b-En) injection reduced the expression of epidermal gene, xK81 in animal cap explants and in whole embryos of Xenopus (Figs. 1B and 1D; 1st lines). These results collectively indicated Ventx1.1 negatively regulating the neurogenesis in Xenopus embryos. Ventx1.1 inhibited the zic3 expression which was induced by FoxD5b-En in Xenopus embryos. The results suggested that Ventx1.1 may directly inhibit the transcription of early neural genes, including zic3 and foxD5b, causing the neural inhibition in Xenopus. These results support the previous studies that Ventx1.1 inhibits neuro-ectoderm formation and organizer expansion, resulting in the headless phenotype in Xenopus embryos (Hwang et al., 2002; 2003). Previous studies have demonstrated that Ventx1.1 is one of the endogenous neural inhibitors of the Xvent family in Xenopus embryos (Kumar et al., 2018; Yoon et al., 2014a). Our present study reiterated the neural repression activity of Ventx1.1 in Xenopus (Fig. 1). To investigate the role of Ventx1.1 as a neural repressor and its genome-wide targets in Xenopus embryos, we performed a genome-wide Ventx1.1 ChIP-Seq analysis during the gastrula stage after injection of Ventx1.1 mRNA at the one-cell stage embryos. ChIP-Seq results showed that Ventx1.1 bound within the 5′-flanking upstream region of specific neural and dorsal genes, including zic3. ChIP-Seq analysis of coverage plot within the 5′-flanking upstream region of zic3, where Ventx1.1 protein was bound, showed that Ventx1.1 bound to the zic3 promoter region on more than one putative consensus site in Xenopus embryos (Fig. 2B), but not for all the putative consensus binding sites (Fig. 2A). The results indicated that zic3 promoter may contain more than one functionally active Ventx1.1 binding response element. Ventx1.1 ChIP-Seq peak-calling and coverage plot analysis showed Ventx1.1 binding to 4 different regions within the 5′-flanking upstream region of zic3 (Fig. 2B). The putative Ventx1.1 binding sequences within the zic3 promoter using chromosome 8S (Chr8S) were then analyzed (Fig. 2C). The promoter sequences of zic3 Chr8S were compared with those of Chr8L and were found to have the promoter sequences of Chr8S and Chr8L having an overall similarity of 91% (Fig. 2D). To verify the direct binding of Ventx1.1 within the zic3 promoter regions, we injected Flag-Ventx1.1 mRNA at the one-cell stage of Xenopus embryos and performed the ChIP-PCR assay using gastrula embryos. Results showed that Ventx1.1 directly bound to within the distal region of the endogenous zic3 promoter at two different Ventx1.1 response elements (VRE1 and VRE2) in Xenopus embryos (Fig. 2E). The two VRE sequences targeted for ChIP-PCR within the zic3 promoter were exactly conserved in Chr8S and Chr8L (Fig. 2F). Taken together, genome-wide Xenopus ChIP-Seq analysis of Ventx1.1 led to identification of Ventx1.1 response cis-acting elements (VREs) within the zic3 promoter. To identify the functionally active Ventx1.1 binding response elements (VREs) within the zic3 promoter region, we cloned the 1.8 kbs long 5′-flanking region of zic3 with respect to the putative transcription initiation site (TSS) and performed a reporter gene assay at the embryonic stage 11. Already shown, Ventx1.1 directly bound to the zic3 promoter and abolished the mRNA expression of zic3 and foxD5b in animal caps explants and whole embryos. As such, we then asked whether Ventx1.1 would indeed inhibit the relative promoter activity of the isolated zic3 promoter. We examined the zic3(−1805) reporter construct and its serially-deleted promoter constructs (Fig. 3A) with and without Ventx1.1 at the one-cell stage. The results showed Ventx1.1 significantly reduced (by 4 to 5-fold) the relative reporter activities of serially-deleted promoter constructs of zic3(−1805, −910 and −517) when compared to that of the zic3 promoter construct in the absence of Ventx1.1 in Xenopus embryos (Fig. 3B, bar 1–6). The relative reporter activity of zic3(−517) promoter construct (Fig. 3B, bar 5–6) was similarly reduced by Ventx1.1 when compared to those of the longer constructs, zic3(−1805 and −910) (Fig. 3B, bar 1–4). For the zic3(−297) promoter construct, however, the Ventx1.1-mediated reduction in the relative promoter activity of zic3(−297) was completely abolished (Fig. 3B, bar 7–8). Mapping of the zic3 promoter nucleotide sequences between −517 and −297 indicated that the zic3(−517) promoter construct contains one putative Ventx1.1 consensus sequence (VRE1) within the −351 bps to −344 bps from the putative TSS (Fig. 3C). To verify the VRE1 consensus sequence as an active cis-acting element, we performed site-directed mutagenesis (ATATTTG to ATAGGGG) of the putative VRE1 consensus sequence in zic3(−1805, −910 and −517) promoter constructs (Fig. 3C). We then tested the relative promoter activity of wild-type and mutated VRE1 promoter constructs zic3(−1805, −910, and −517) with and without Ventx1.1. Results showed Ventx1.1-mediated reduction in the relative promoter activity of zic3(−910 and −517) promoter constructs being completely abolished with zic3(−910)mVRE1 and zic3(−517)mVRE1 promoter constructs (Figs. 3D–3E) while Ventx1.1-mediated reduction in the relative promoter activity of zic3(−1805) promoter construct being significantly, but not completely, preserved in zic3(−1805)mVRE1 promoter constructs (Fig. 3F). These results collectively confirmed that VRE1(−351 bps to −344 bps) acts as a direct cisacting response element for Ventx1.1 binding and plays a significant role in inhibiting the zic3 transcription activation. Since Ventx1.1 decreased the relative promoter activity of zic3(−1805)mVRE1 construct, we reasoned that zic3(−1805) may also contain another VRE within the upstream region of zic3(−910) as Ventx1.1-mediated reduction in the relative promoter activity of zic3(−910) was completely abolished in zic3(−910)mVRE1 (Fig. 3F). We then mapped the nucleotide sequences between zic3(−1805 to −910) and found 3 putative VRE consensus binding sequences upstream of the putative zic3 TSS (Figs. 3B and 3C). The peak-calling analysis of Ventx1.1 ChIP-Seq indicated Ventx1.1 directly bound within the upstream region of zic3 promoter on one putative consensus sequence located within the −1269 bps to −1263 bps upstream of zic3(−910) (Figs. 2 and 3G). We next examined whether the putative VRE consensus binding site2 (VRE2) is also required for Ventx1.1-mediated repression of zic3 transcription in Xenopus embryos. The VRE2 site was found in Ventx1.1 ChIP-Seq peak-calling analysis for coverage fold (≥10 coverage fold) (Figs. 2B and 2C). We next performed site-directed mutagenesis within the (−1269 bps to −1263 bps) and generated the VRE2-mutated zic3(−1805)mVRE2 and doubly-mutated zic3(−1805)mVRE(1+2) promoter constructs (Fig. 3G). These constructs were then examined for their relative promoter activity in the context of presence and absence of Ventx1.1. Results showed that zic3(−1805)mVRE2 construct restored the Ventx1.1-mediated reduction in the relative promoter activity of zic3(−1805), and zic3(−1805)mVRE2 still significantly sustained Ventx1.1-mediated reduction (about 2.5-fold) in the relative promoter activity. This compared with reduction by Ventx1.1 of 10-fold in the relative promoter activity of wild-type zic3(−1805) promoter construct compared to that of zic3(−1805) alone (Fig. 3H). This indicated that VRE2 also significantly contributes to Ventx1.1-mediated repression of zic3 transcription activation. In summary, both cis-acting elements of VRE1(−351 bps to −344 bps) and VRE2(−1269 bps to −1263 bps) seem to contribute to Ventx1.1-mediated repression of neural gene zic3 transcription. To confirm this, we tested the wild-type zic3(−1805) and mutated constructs zic3(−1805)mVRE1, zic3 (−1805)mVRE2, and the doubly-mutated zic3(−1805)mVRE(1+2) version with and without Ventx1.1 in Xenopus embryos. The results showed that Ventx1.1-mediated reduction in the relative reporter activity of wild-type zic3(−1805) promoter was completely restored in doubly-mutated zic3(−1805)mVRE(1+2) (Fig. 3I, 7–8th bar). Actually, Ventx1.1 significantly increased the relative promoter activity of doubly-mutated zic3(−1805)mVRE(1+2) promoter construct (Fig. 3I). From these experiments, it was concluded that zic3(−1805) promoter contains two VRE cis-acting response elements. VRE1 is within the (−351 bps to −344 bps) region while VRE2 is located within the (−1269 bps to −1263 bps) 5′-flanking upstream region of zic3 from its putative TSS. Previously, FoxD5b-En increased zic3 expression in both animal cap explants and whole embryos as shown via RT-PCR (Fig. 1). To examine whether FoxD5b-En would also increase the relative reporter activities of various zic3 promoter constructs, we co-injected the serially deleted zic3 promoter constructs with and without FoxD5b-En at the one-cell stage and measured their relative reporter activities in Xenopus embryos. Results showed that FoxD5b-En increased the relative promoter activity of serially-deleted zic3 promoter constructs from 1.5 to 2.5-fold compared to the zic3 promoter construct alone and depending on the construct (Fig. 4A). The results indicated that zic3(−517) promoter construct may contain FoxD5b binding response elements (FRE) which positively regulate zic3 transcriptional activation in Xenopus embryos. The zic3(−517) promoter construct also contains a direct Ventx1.1 binding response elements1 (VRE1) within the −351 bps to −344 bps region of zic3 promoter. Our unpublished results have shown that FoxD5b directly inhibits ventx1.1 transcription in Xenopus embryos. Thus, we asked whether FoxD5b increases zic3 promoter activity in a Ventx1.1-dependent manner and examined the VRE1-mutated zic3(−517)mVRE1 promoter construct with and without FoxD5b-En. Results showed that FoxD5b-En-mediated induction in the relative promoter activity of zic3(−517) promoter construct was completely abolished in zic3(−517)mVRE1 (Fig. 4B). 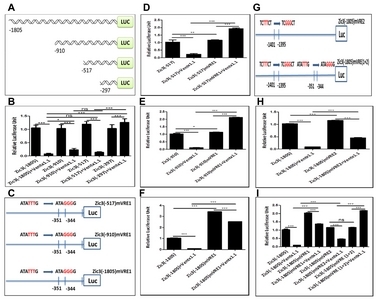 Previous study has demonstrated that Xcad2 is one of the positive regulators of BMP4 signaling and a homeobox transcriptional activator which induces the expression of bmp4 and ventx1.2 while it inhibits the expression of gsc and chordin in order to inhibit embryo dorsalization in Xenopus embryos (Levy et al., 2002; Pillemer et al., 1998). Since ectopic expression of Xcad2 inhibits organizer specific gene including gsc and chordin, we asked whether Xcad2 negatively regulates zic3 transcription. The reporter activity of zic3 (−517) was examined with and without Xcad2 in Xenopus embryos. Results showed that Xcad2 reduced the relative promoter activity of zic3(−517) (Fig. 4C, 1st and 2nd bar). However, Xcad2-mediated reduction in the relative promoter activity of zic3(−517) promoter construct was completely abolished in zic3(−517)mVRE1 (Fig. 4C, 3rd and 4th bar). These results point to having FoxD5b and Xcad2 regulate zic3 transcription in a ventx1.1 -dependent manner. From these observations, Ventx1.1 as one of the negative regulators of neurogenesis directly inhibits the zic3 transcription in Xenopus embryos. In this light, Ventx1.1 mediates its inhibition on the zic3 promoter via two Ventx1.1 consensus binding response elements within the 5′-flanking distal region of zic3, namely VRE1 (−351 bps to −344 bps) and VRE2 (−1269 bps to −1263 bps). BMP4/Smad1 is a crucial signaling circuit determining the fate of ectoderm cells for ectoderm and neuro-ectoderm as well as for ventral and dorsal mesoderm in the early embryogenesis of vertebrates (Ault et al., 1996; Dale and Jones, 1999; Hwang et al., 2003). Both gradients of BMP4/Smad1 from ventral to dorsal mesoderm and from ectoderm to endoderm are important for primordial germ layer specification of mid-blastula embryos (Cha et al., 2008; Maeno et al., 1996; Sasai, 1998). A high concentration of instructive BMP4 signal is required to induce the ventral mesoderm and ectoderm (Maeno et al., 1996; Suzuki et al., 1997a; Wilson et al., 1997), but on the other hand, inhibition of BMP4 signal is crucial for generating the dorsal mesoderm (Spemann organizer) for blastula embryos and the neuro-ectoderm for the gastrula embryos (Delaune et al., 2005; De Robertis and Kuroda, 2004; Sasai et al., 1995; Xu et al., 1995). At the mid-blastula stage, a BMP4/Smad1 signal starts to induce transcription of a set of immediate early genes (maternal to zygotic transition genes), including ventx1/2, gata1/2, and msx1, the transcription factors in the ventral side of embryos. Our previous studies have shown that Ventx1.1 is one of the direct targets of BMP4/Smad1 signaling and inhibits neurogenesis and organizer specific genes in Xenopus embryos. These studies demonstrated that ventx1.1 functions as a repressor of neuro-ectoderm formation under various conditions (Kumar et al., 2018; Hwang et al., 2002; 2003; Yoon et al., 2014a; 2014b). However, an observation of the direct inhibition of early neural genes by Ventx1.1 has been elusive and not reported. From the recent completion of the Xenopus laevis genome project (Session et al., 2016), we have started the investigation of various gene regulatory networks underlying germ layer specification at a genome-wide scale. Genome-wide target validation experiments, including ChIP-Seq analysis, can now be performed for mapping of various transcription factors directly binding and modulating various promoters and for uncovering various transcriptional regulatory networks relevant to various developmental stages. In the present study, genome-wide Ventx1.1 ChIP-Seq assay indicated that during gastrula of Xenopus laevis, neural gene zic3 is one of the direct targets of Ventx1.1 and that Ventx1.1 directly binds to the 5′-flanking region of zic3 at more than one functional site (Figs. 2A–2C). Previously, it was reported that downstream target genes of BMP4/Smad1 such as gata-1b, msx1 and Dlx1 promote epidermal differentiation and inhibit early neurogenesis (Feledy et al., 1999; Suzuki et al., 1997b; Xu et al., 1997). However, a direct binding of those neural repressors on cisacting elements within the promoter regions of early neural genes has not been reported. In the present study, genome-wide ChIP-Seq analysis of Ventx1.1 for Xenopus laevis identified Ventx1.1 cis-acting elements on the zic3 promoter region. In addition, Ventx1.1 was found to be one of the negative regulators of the early neuro-ectoderm gene, zic3. The zic3 promoter contains two Ventx1.1 consensus binding response elements, VRE1 (−351 bps to −344 bps) and VRE2 (−1269 bps to −1263 bps) which locate within the 5′-flanking region of zic3 (Figs. 1–3). ChIP-Seq peak-calling analysis indicated four major binding sites for Ventx1.1. In this work, we assigned two of those four binding sites as together being able to lead to complete inhibition of zic3 promoter as shown via various reporter constructs in Xenopus embryos (Fig. 3I). Ventx1.1 as one of the direct downstream targets of BMP4/Smad1 signaling directly represses expression of zic3 and via direct binding within the endogenous promoter region of zic3 (Fig. 2E). FoxD5b-En, on the other hand, increases the relative promoter activity of zic3 (Fig. 4A). A previous study using microarray analysis showed that FoxD4L1/D5 inhibits ventral gene expression, including bmp4 and dlx1 (Yan et al., 2010). As FoxD5b inhibits bmp4 expression that leads to inhibition of ventx1.1 expression, it was interesting to evaluate Ventx1.1 involvement in FoxD5b-mediated induction of zic3 expression. We reasoned that as FoxD5b-En induces zic3 expression, this may at least be partially through the inhibition of Ventx1.1. The site-directed mutagenesis construct of zic3(−517)mVRE1 also abolished FoxD5b-En-mediated reporter activation which was instead observed with the wild-type reporter gene construct of zic3 (−517)(Fig. 4B). These results indicate that FoxD5b-En-mediated promoter activation of zic3(−517) is at least partially dependent on the repression of endogenous Ventx1.1. 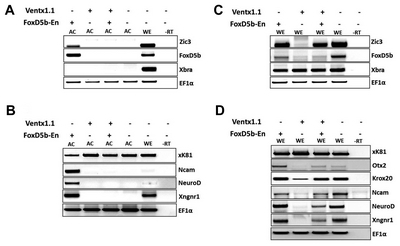 Presently, we do not know whether FoxD5b-En enhances zic3 expression through this negative regulation of ventx1.1 alone or through a more complicated route, directly and/or indirectly affecting the ventx1.1 action. Xcad2 is one of the positive regulators of BMP4 signaling and is a homeobox transcriptional activator which induces the expression of bmp4 and ventx1.2 (Levy et al., 2002; Pillemer et al., 1998). 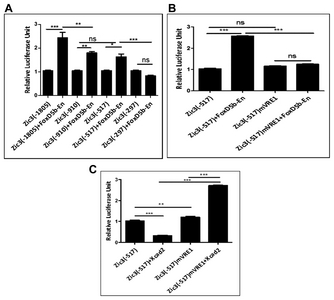 The relative promoter activities of zic3(−517) were reduced in presence of Xcad2 (Fig. 4C, 1st and 2nd bar), and we asked whether Xcad2-mediated reduction in the relative promoter activity of zic3(−517) may also at least partially be regulated through the Ventx1.1 response element (VRE1) in zic3 promoter. Interestingly, the site-directed mutagenesis construct of zic3(−517)mVRE1 abolished the Xcad2-mediated reduction in the relative promoter activity of wild-type construct of zic3(−517) (Fig. 4C, 3rd and 4th bar) and Xcad2 actually enhanced the relative promoter activity of zic3(−517)mVRE1. The Xcad2-mediated reduction in the relative promoter activity of zic3 (−517) promoter construct was significantly increased compared with zic3(−517)mVRE1 promoter construct (Fig. 4C). Ventx1.1 also significantly increased the relative promoter activity of VRE1-mutated zic3 promoter construct (Figs. 3D, 3E and 3I). We observe that VRE1-mutated zic3(−517)mVRE1 promoter construct contains at least one negative cis-acting response element(s) where a putative transcription factor, which is decreased directly or indirectly by Xcad2, may bind. We suspect that gsc may be the factor which is decreased by ectopic expression of Xcad2 and negatively regulates the zic3 promoter activity (based on ChIP-Seq data and reporter gene assays of zic3(−517), unpublished data). The identity of the factor has yet to be discovered. The results collectively indicate that both FoxD5b and Xcad2 positively and negatively regulate the reporter activity of zic3(−517), respectively, and in a VRE1-dependent manner. Based on these results, we propose that Ventx1.1 is a key molecule in the positive and negative circuits for ectoderm and neuro-ectoderm specification as well as ventral-dorsal specification of early Xenopus embryos. The first main event in neural tissue formation including for the central and peripheral nerve system is neuro-ectoderm formation from the naive ectoderm. In the ectoderm, high BMP4/Smad1 signal gradient induces the expression of the immediate early transcription factors (MZT genes), including ventx1.1. In this work, we demonstrated that one of the immediate early transcription factors induced by BMP4/Smad1 signal in the ectoderm directly represses the transcription of zic3, which is a commitment gene of the neuro-ectoderm. A genome-wide ChIP-Seq of Ventx1.1 showed that Ventx1.1 directly binds to the promoter regions of neural as well as organizer specific genes including zic3, noggin, chordin, foxD5b and gsc in Xenopus embryos (unpublished data). BMP inhibition by secreting organizer proteins also leads to expression of zic3 and foxD5b in the neuro-ectoderm. In genome-wide ChIP-Seq for FoxD5b, FoxD5b directly binds to the promoter regions of ventx1.1 to repress ventx1.1 expression (unpublished data). Therefore, we hypothesize that a reciprocal repression networks exists among the germ layer specific repressor factors and suggest ventx1.1 as a reciprocal repressor in the ectoderm and FoxD5b as a reciprocal repressor in the neuro-ectoderm environments. For the ectoderm vs. neuro-ectoderm determination, as a newly transcribed repressor, Ventx1.1 opposes foxD5b presence in the ectoderm while FoxD5b opposes ventx1.1 presence in the neuro-ectoderm in order to repress the other factor’s effect at a defined territory. In this study, we found that Ventx1.1 preoccupied the ectoderm region to repress the early neuro-ectoderm gene, zic3. Initially, BMP4 signaling is high at the ventral side and after the mid-blastula or mid-blastula transition (MBT), the immediate early target gene ventx1.1 preoccupies this region and starts to repress the dorsal and neural specific genes in order to maintain the epidermal fate and its differentiation. Xcad2 as one of the downstream target genes of the BMP4/Smad1 pathway is expressed around the blastopore and positively contributes to the expression of ventx1.1 for indirect repression of zic3 expression (Fig. 5. left panel). FoxD5b, on the other hand, is expressed as a neural specific repressor in the neuro-ectodermal region. FoxD5b at least partially contributes to the expression of another neural gene, namely zic3, through repression of ventx1.1 (Fig. 5. right panel). Based on the results for our reciprocal repression model, a putative mechanism of zic3 transcriptional regulation in ectoderm and neuro-ectoderm regions during gastrula of Xenopus embryos is proposed (Fig. 5). Fig. 1. Ventx1.1 (500 pg/embryo) mRNA was co-injected with and without FoxD5b-En mRNA (280 pg/embryos) at the one-cell stage, followed by dissection of the animal cap explants (AC) at stage 8 and harvesting at stage 11 and 24 respectively. The relative gene expressions were analyzed by RT-PCR: (A and C) Ventx1.1 reduced the FoxD5b-induced expression of zic3 and foxD5b in both animal cap explants (A) and whole embryos (WE) (B) at stage 11. (B and D) Ventx1.1 reduced the FoxD5b-En-induced expression of ncam, Xngnr (pan-neural markers) and NeuroD (neuronal differentiation marker) while induced the expression of xK81 (keratin marker) at stage 24. EF1α loading control, non-injected animal caps (negative control), whole embryo (WE) (positive control), control reaction without reverse transcriptase (−RT). Fig. 2. (A) Putative Ventx1.1 response consensus binding elements (VREs) are presented within the upstream promoter region of zic3 gene. (B) ChIP-Seq coverage plot of 3Flag-Ventx1.1 on the zic3 promoter. (C) Putative VRE sequences and their locations within the zic3 promoter. (D) This plot is showing the similarity in structure between Chr8S and Chr8L of zic3 promoter with the VRE1 and VRE2 locations marked. (E) In the ChIP assay, 3Flag-Ventx1.1 construct (500 pg/embryos) was injected at the one-cell stage and the embryos were harvested at stage 11 in 30% MMR solution. Anti-Flag antibody was used to immune-precipitate the endogenous zic3 promoter region. VRE1 and VRE2 were measured by PCR with specific zic3 promoter primers. (F) Consensus binding motifs of VRE1 and VRE2 are fully matched in both Chr8S and Chr8L of the zic3 promoter regions. Fig. 3. (A) Schematic representation of serially-deleted zic3 promoter constructs. (A–I) Different serially-deleted zic3 (40 pg/embryos) promoter constructs were co-injected with and without Ventx1.1 (500 pg/embryos) at the one-cell stage and grown until stage 11 to measure the relative promoter activity. The data are shown as mean ± S.E. of the values from at least three independent experiments. Differences were considered significant at P < 0.05. Fig. 4. Different serially-deleted zic3(40 pg/embryos) promoter constructs were co-injected with and without FoxD5b-En (280 pg/embryos) at the one-cell stage and grown until stage 11 to measure the relative promoter activity. (A) FoxD5b-En increased the relative promoter activity of zic3(−1805) promoter region compared to zic3(−1805) alone. (B) zic3(−517) and zic3(−517)mVRE1 promoter constructs were co-injected with and without FoxD5b-En in separate groups. The FoxD5b-mediated induction in the relative promoter activity of zic3(−517) was abolished in zic3(−517)mVRE1. (C) zic3(−517) and zic3(−517)mVRE1 promoter constructs were co-injected with and without Xcad2 in separate groups. The Xcad2-mediated reduction in the relative promoter activity of zic3(−517) was abolished in zic3(−517)mVRE1 reporter construct. The data are shown as mean ± S.E. of the values from at least three independent experiments. Differences were considered significant at P < 0.05. Fig. 5. Ventx1.1 seems play an essential role in the BMP4/Smad1/Xcad2/Ventx1.1-mediated neural inhibition in Xenopus embryos during gastrula. Ault, K.T., Dirksen, M.L., and Jamrich, M. (1996). A novel homeobox gene PV.1 mediates induction of ventral mesoderm in Xenopus embryos. Proc Natl Acad Sci USA. 93, 6415-6420. Blythe, S.A., Reid, C.D., Kessler, D.S., and Klein, P.S. (2009). Chromatin immunoprecipitation in early Xenopus laevis embryos. Dev Dyn. 238, 1422-1432. Cha, S.W., Lee, J.W., Hwang, Y.S., Chae, J.P., Park, K.M., Cho, H.J., Kim, D.S., Bae, Y.C., and Park, M.J. (2008). Spatiotemporal regulation of fibroblast growth factor signal blocking for endoderm formation in Xenopus laevis. Exp Mol Med. 40, 550-557. Dale, L., and Jones, C.M. (1999). BMP signalling in early Xenopus development. Bioessays. 21, 751-760. De Robertis, E.M., and Kuroda, H. (2004). Dorsal-ventral patterning and neural induction in Xenopus embryos. Annu Rev Cell Dev Biol. 20, 285-308. Delaune, E., Lemaire, P., and Kodjabachian, L. (2005). Neural induction in Xenopus requires early FGF signalling in addition to BMP inhibition. Development. 132, 299-310. Feledy, J.A., Beanan, M.J., Sandoval, J.J., Goodrich, J.S., Lim, J.H., Matsuo-Takasaki, M., Sato, S.M., and Sargent, T.D. (1999). Inhibitory patterning of the anterior neural plate in Xenopus by homeodomain factors Dlx3 and Msx1. Dev Biol. 212, 455-464. Henningfeld, K.A., Friedle, H., Rastegar, S., and Knochel, W. (2002). Autoregulation of Xvent-2B; direct interaction and functional cooperation of Xvent-2 and Smad1. J Biol Chem. 277, 2097-2103. Houtmeyers, R., Souopgui, J., Tejpar, S., and Arkell, R. (2013). The ZIC gene family encodes multi-functional proteins essential for patterning and morphogenesis. Cell Mol life Sci. 70, 3791-3811. Hwang, Y.S., Lee, H.S., Roh, D.H., Cha, S., Lee, S.Y., Seo, J.J., Kim, J., and Park, M.J. (2003). Active repression of organizer genes by C-terminal domain of PV.1. Biochem Biophys Res Commun. 308, 79-86. Hwang, Y.S., Seo, J.J., Cha, S.W., Lee, H.S., Lee, S.Y., Roh, D.H., Kung Hf, H.F., Kim, J., and Ja Park, M. (2002). Antimorphic PV.1 causes secondary axis by inducing ectopic organizer. Biochem Biophys Res Commun. 292, 1081-1086. Kumar, S., Umair, Z., Yoon, J., Lee, U., Kim, S.C., Park, J.B., Lee, J.Y., and Kim, J. (2018). Xbra and Smad-1 cooperate to activate the transcription of neural repressor ventx1.1 in Xenopus embryos. Sci Rep. 8, 11391. Lee, H.S., Lee, S.Y., Lee, H., Hwang, Y.S., Cha, S.W., Park, S., Lee, J.Y., Park, J.B., Kim, S., and Park, M.J. (2011). Direct response elements of BMP within the PV.1A promoter are essential for its transcriptional regulation during early Xenopus development. PloS one. 6, e22621. Lee, H.S., Park, M.J., Lee, S.Y., Hwang, Y.S., Lee, H., Roh, D.H., Kim, J.I., Park, J.B., Lee, J.Y., and Kung, H.F. (2002). Transcriptional regulation of Xbr-1a/Xvent-2 homeobox gene: analysis of its promoter region. Biochem Biophys Res Commun. 298, 815-823. Lee, S.Y., Lee, H.S., Moon, J.S., Kim, J.I., Park, J.B., Lee, J.Y., Park, M.J., and Kim, J. (2004). Transcriptional regulation of Zic3 by heterodimeric AP-1(c-Jun/c-Fos) during Xenopus development. Exp Mol Med. 36, 468-475. Levy, V., Marom, K., Zins, S., Koutsia, N., Yelin, R., and Fainsod, A. (2002). The competence of marginal zone cells to become Spemann’s organizer is controlled by Xcad2. Dev Biol. 248, 40-51. Maeno, M., Mead, P.E., Kelley, C., Xu, R.H., Kung, H.F., Suzuki, A., Ueno, N., and Zon, L.I. (1996). The role of BMP-4 and GATA-2 in the induction and differentiation of hematopoietic mesoderm in Xenopus laevis. Blood. 88, 1965-1972. Munoz-Sanjuan, I., and Brivanlou, A.H. (2002). Neural induction, the default model and embryonic stem cells. Nat Rev Neurosci. 3, 271-280. Nakata, K., Nagai, T., Aruga, J., and Mikoshiba, K. (1998). Xenopus Zic family and its role in neural and neural crest development. Mech Dev. 75, 43-51. Pillemer, G., Yelin, R., Epstein, M., Gont, L., Frumkin, Y., Yisraeli, J.K., Steinbeisser, H., and Fainsod, A. (1998). The Xcad-2 gene can provide a ventral signal independent of BMP-4. Mech Dev. 74, 133-143. Rogers, C.D., Moody, S.A., and Casey, E.S. (2009). Neural induction and factors that stabilize a neural fate. Birth Defects Res C Embryo Today. 87, 249-262. Sasai, Y. (1998). Identifying the missing links: genes that connect neural induction and primary neurogenesis in vertebrate embryos. Neuron. 21, 455-458. Sasai, Y., Lu, B., Steinbeisser, H., and De Robertis, E.M. (1995). Regulation of neural induction by the Chd and Bmp-4 antagonistic patterning signals in Xenopus. Nature. 376, 333-336. Session, A.M., Uno, Y., Kwon, T., Chapman, J.A., Toyoda, A., Takahashi, S., Fukui, A., Hikosaka, A., Suzuki, A., and Kondo, M. (2016). Genome evolution in the allotetraploid frog Xenopus laevis. Nature. 538, 336-343. Shim, S., Bae, N., Park, S.Y., Kim, W.S., and Han, J.K. (2005). Isolation of Xenopus FGF-8b and comparison with FGF-8a. Mol Cells. 19, 310-317. Suzuki, A., Kaneko, E., Maeda, J., and Ueno, N. (1997a). Mesoderm induction by BMP-4 and -7 heterodimers. Biochem Biophys Res Commun. 232, 153-156. Suzuki, A., Ueno, N., and Hemmati-Brivanlou, A. (1997b). Xenopus msx1 mediates epidermal induction and neural inhibition by BMP4. Development. 124, 3037-3044. Wilson, P.A., Lagna, G., Suzuki, A., and Hemmati-Brivanlou, A. (1997). Concentration-dependent patterning of the Xenopus ectoderm by BMP4 and its signal transducer Smad1. Development. 124, 3177-3184. Xu, R.H., Kim, J., Taira, M., Lin, J.J., Zhang, C.H., Sredni, D., Evans, T., and Kung, H.F. (1997). Differential regulation of neurogenesis by the two Xenopus GATA-1 genes. Mol Cell Biol. 17, 436-443. Xu, R.H., Kim, J., Taira, M., Zhan, S., Sredni, D., and Kung, H.F. (1995). A dominant negative bone morphogenetic protein 4 receptor causes neuralization in Xenopus ectoderm. Biochem Biophys Res Commun. 212, 212-219. Yan, B., Neilson, K.M., and Moody, S.A. (2010). Microarray identification of novel downstream targets of FoxD4L1/D5, a critical component of the neural ectodermal transcriptional network. Dev Dyn. 239, 3467-3480. Yoon, J., Kim, J.H., Kim, S.C., Park, J.B., Lee, J.Y., and Kim, J. (2014a). PV.1 suppresses the expression of FoxD5b during neural induction in Xenopus embryos. Mol Cells. 37, 220-225. Yoon, J., Kim, J.H., Lee, O.J., Lee, S.Y., Lee, S.H., Park, J.B., Lee, J.Y., Kim, S.C., and Kim, J. (2013). AP-1(c-Jun/FosB) mediates xFoxD5b expression in Xenopus early developmental neurogenesis. Int J Dev Biol. 57, 865-872. Yoon, J., Kim, J.H., Lee, S.Y., Kim, S., Park, J.B., Lee, J.Y., and Kim, J. (2014b). PV.1 induced by FGF-Xbra functions as a repressor of neurogenesis in Xenopus embryos. BMB Rep. 47, 673-678. Yu, S.B., Umair, Z., Kumar, S., Lee, U., Lee, S.H., Kim, J.I., Kim, S., Park, J.B., Lee, J.Y., and Kim, J. (2016). xCyp26c induced by inhibition of BMP signaling is involved in anterior-posterior neural patterning of Xenopus laevis. Mol Cells. 39, 352-357.